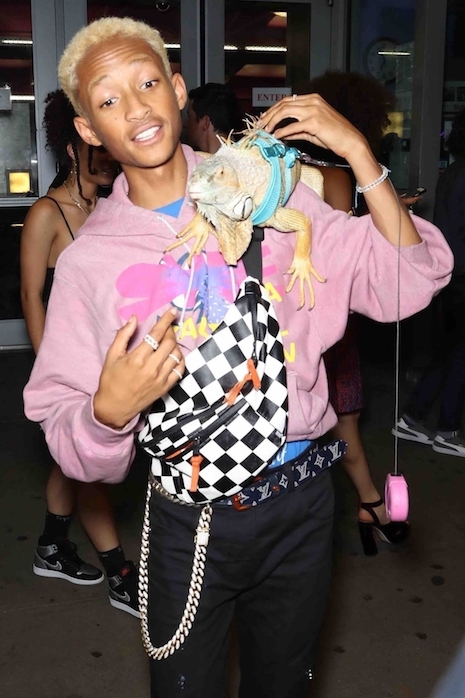 Jaden Smith didn’t need a date for the New York premier of his movie Skate Kitchen, his plus-1 was his pet Iguana on a leash. (Jaden and his sister Willow both love reptiles.) The movie documents the lives of a pack of real female skateboarders flourishing in a male dominated subculture in New York. Most of the skaters are the real thing — non-actors – discovered by the director. Jaden, 20, plays a skating romantic interest for one of the girls. Nice to see two longtime friends – both with amazing life stories – getting together for lunch in Beverly Hills. Actress Anjelica Huston, now 67, met model Jerry Hall, now 62, in London back in the seventies when Angelica visited her boyfriend Jack Nicholson, who was filming there. At the time Jerry had just left Bryan Ferry for her new boyfriend Mick Jagger and the two couples hit it off. Decades later, Anjelica married sculptor Robert Graham and he left her a widow in 2008. Two years ago Jerry married media tycoon Rupert Murdoch, so the gal pals have a LOT to gossip about.